Looking for that distinctive and ultra-unique domain that represents you? Try adding a .me to your list of domains! Originally allocated as the internet country code top-level domain or ccTLD for the country Montenegro in Southern Europe, it has been astutely marketed as the ultimate destination of every individual in first person. The fact that the english language has several words ending with these letters has also led to many quirky uses of this extension that now is a hallmark of several social buzz based platforms. Due to the growing popularity of the TLD, several individuals and companies have lapped up the .me domain name. We discuss the history of the domain name and its slow evolution into a popular marketing tool. Montenegro had been allocated this unique domain name by ICANN. 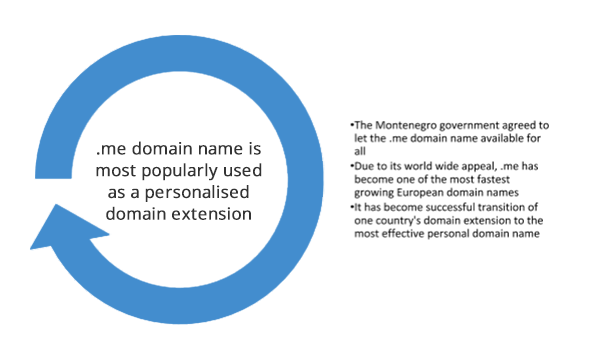 A Joint venture between Afilias, a prominent registry services platform and the ME –net d.o.o, the Montenegrin entity that co-manages the registry led to the creation of the doMEn d.o.o to handle the administration for .me domain names. In comparison with the other domain extensions, the .me domain name continues to gather momentum with increasing company strategies towards owning a personalized domain extension. 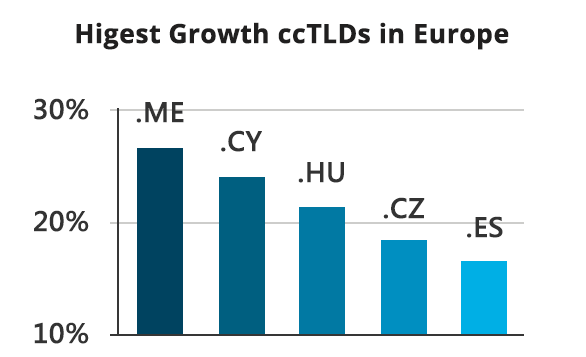 Now, .me features amongst the highest selling domains in Europe. Having a .me domain is being recognized as a must have in the upwardly mobile sections of the internet society than as a narcissist one, thanks to the social revolution. By establishing a deep personal connect with the registrants – usually individual since the focus is on the name of the person, .ME has ensured that there is a lot of quality content that has been meticulously worked on very often on websites hosted with this extension. More than communicating marketing strategy and brand ideas, people have personalized the .me domain to communicate ideas, views and opinions. While some companies have expressed their visions and plans for the future via their personal blogs, others have used the domain extension to communicate with customers. One such domain is Formspring.me, which has become popular as an ideal question and answer platform catering to anyone around the world. One of the most popular websites on this extension is the About.me portal, which has been acquired by AOL due to its quick and easy customized web-building options. Blog.Me, a South Korean platform has gathered over 27 million users. Those who wanted to tap into blogging and social media content have optimized .me significantly. In a world of the smartphones and mobile adaptability, companies have tapped into personalized blogging on social media platforms led by .me. Facebook’s FB.Me, WordPress’s WP.Me, Yahoo’s ME.Me and Time Magazine’s TI.Me have been staggering examples of companies who have lapped up the advantage put forth by the domain name. Most marketing gurus state that the .ME Registry has accomplished its success with the .me domain due to its simplicity, value and unique brand presence online. In partnership with the .ME Registry, we at ResellerClub have been running an exclusive promotion on .ME Domains where you can avail .ME registrations at a fabulous discounted price of $4.79 all through August. To assist you in your marketing efforts and help you grow your business, we are hosting an exclusive webinar on“How you can make .ME work for you” with Vuksan Rajković, Business Development Manager, .ME Registry and Minal Agarwal, Sr. Manager, Marketing & Business Development, ResellerClub on 28th of August, 2014. In this webinar, we will explore the potential of .ME namespace and talk about the various benefits your customers can get by availing a .ME domain. Also learn about how you can benefit from ResellerClub’s partnership with the .ME registry and discuss ideas on how you can position .ME to boost your profits!